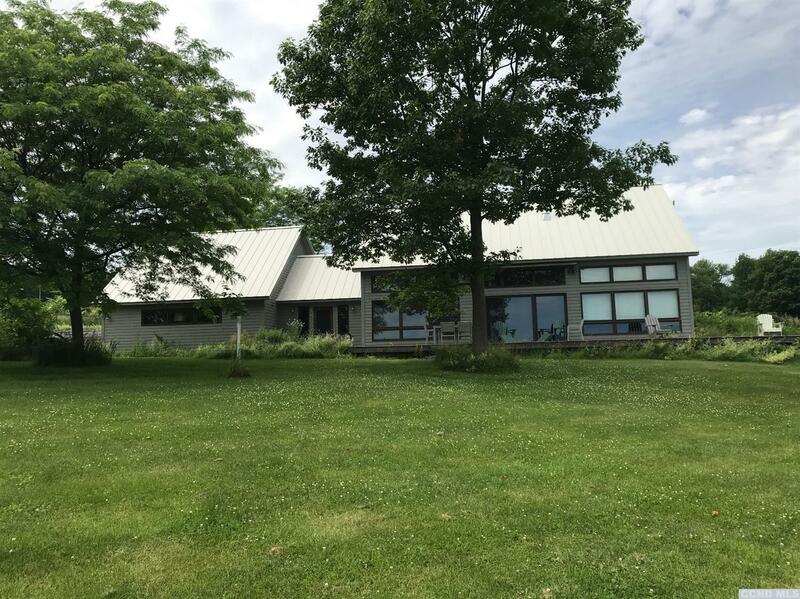 Nature's bounty with fields of dreams are upon this 47.47 acres property with sun filled afternoons of nature walks, swimming in the 10'deep pond or just relaxing on the over sized deck admiring the view. Contemporary bank home has 3 bedroom 2.5 baths. Newer concrete siding and metal roof. Living and dining room with vaulted ceilings, tile floors, wood stove and a picturesque view of the dramatic valley view. Open concept kitchen with granite counters and breakfast bar. Spacious family room with wood stove. Spacious room over family could be another bedroom, office or recreation room. Two master bedrooms, one on each floor and a full bath. Additional bedroom on second floor. Den/office on main level. Laundry room and a walk in large pantry. Spacious foyer & mud room. You could live off the grid with this solar passive home, just need to install solar panels. Land currently setup for beef cattle, new electric fence installed & haying. 10 Minutes to Wassaic Train & Village of Millerton.